Have you joined in with the latest craze of painting and hiding rocks? We have. My daughter’s two favourite things are art and rocks so it is an activity which seems to have been designed specifically for her! We have all had great fun painting them. Also, hunting for and hiding rocks is a great excuse to get her to go out for a walk. Free entertainment – a win all round! If you haven’t heard of this, try putting a search into facebook with your town name and then rocks – eg Cardiff Rocks or whatever. Or there are some national groups too such as Hidden Rocks and Love on the Rocks. 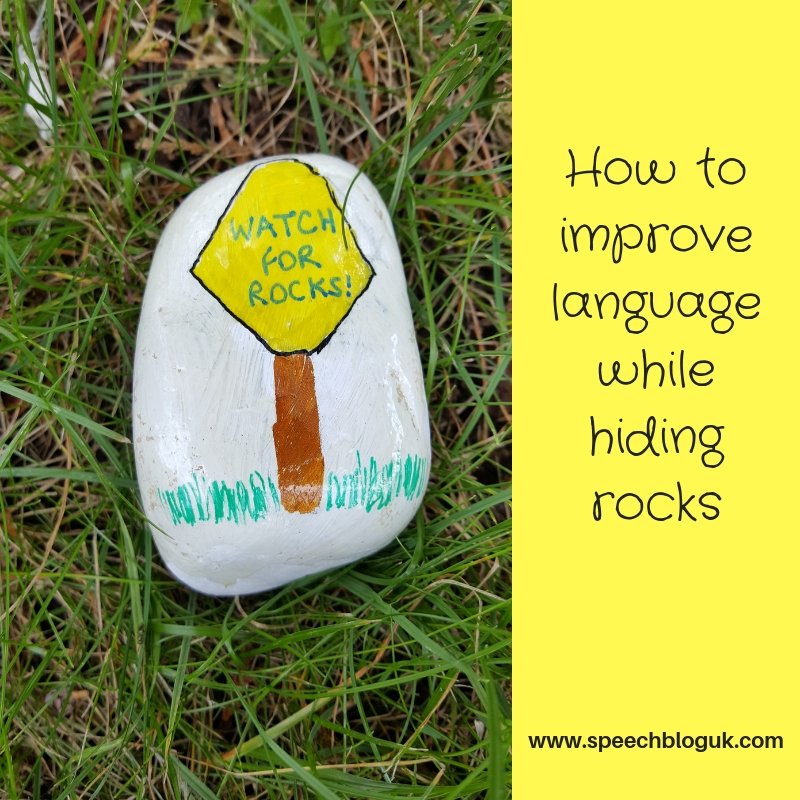 Today I was thinking about all the language that we are using while hiding rocks and what a great activity it is for developing language skills. I thought I would post some of my ideas here. Colours – this is a really fun way to work on colours without even trying really. Name all the colours as you use them. If your child is struggling with colours, it is usually best to just work on 2 or 3 first of all. Reduce the choice of colours to just the ones you are working on and keep naming them as your child paints. Vocabulary – name things as you paint. If you are painting an animal, don’t stick just with the name of the animal, talk about its different parts as you paint – ears, eyes, tail etc. With a more verbal child, try words like antlers (if you’re brave enough to try painting an animal with them!) or hooves. Shape and pattern words come up naturally if you are doing more abstract painting – spots, stripes, square, triangle etc. There are lots of opportunities out repeat the vocabulary – several times as you are painting, again when you varnish and again several times while you are hiding rocks. Speech sounds – this one may need a little more planning. If your child is working on a particular speech sound, think in advance of some simple things you could paint that start with that sound. Or some that you can suggest to them to paint if they are open to suggestions. For example, if your child is working on “c”, you could paint a car or a cake or a cat. If they are working on “s” maybe a sun or a sock? Make sure you say the word lots as you are painting so that the child hears the target sound. Also, if they are willing and at the right stage of therapy, get them to have a go too. Vocabulary – you can repeat the vocabulary you did when you were painting. Hopefully you will also find some rocks, so you will be able to talk about them too. What colours are on them? What shapes or pictures? Even if you don’t find any, you can talk about all the things you see as you are walking and looking. Story telling – if you find several rocks which have pictures on, see if you can make up a story together with all the different items in. What other ideas can you think of? Have fun! 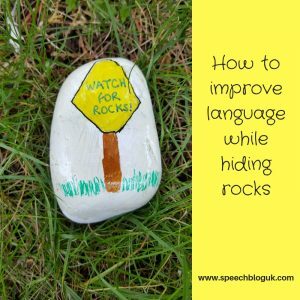 Speech sounds – how to help a child learn and generalise new sounds.